This recipe is as easy and simple. The idea for showing this recipe came from a good reader of ours Blackseabrew. He was just in Ukraine and looks to me like he had some of these fantastic pancakes. 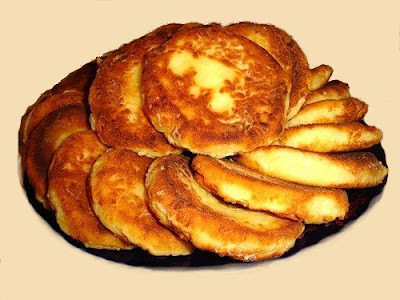 So since Blackseabrew suggested it, I present – Syrniki or Curd Pancakes! Put all the ingredients in a medium size mixing bowl. Mix until the consistency is that of a bread dough and even lumpy in appearance. Add a pinch more flour if it seems to be to thin. I use my fingers and dust them with flour. I pinch off a large spoonful size chunk of dough and roll in a ball. On a floured surface I flatten the ball into a flat pancake. Make sure that you flip dough and coat both sides with flour. Fry until first side is golden brown (or even darker like we like them). Turn the pancake over and fry until the second side is golden brown. Syrniki taste great with sour cream, jam, jelly, preserves, molasses, sorghum, maple syrup and they are great just plain… Yummy! Notes: They are best made with farmers cheese, goat cheese, Syrniki are many times made with a mixture of pot cheese (similar to cottage cheese but is drained longer and therefore has a slightly drier texture). Hense the need to drain cottage cheese very thoroughly in America.